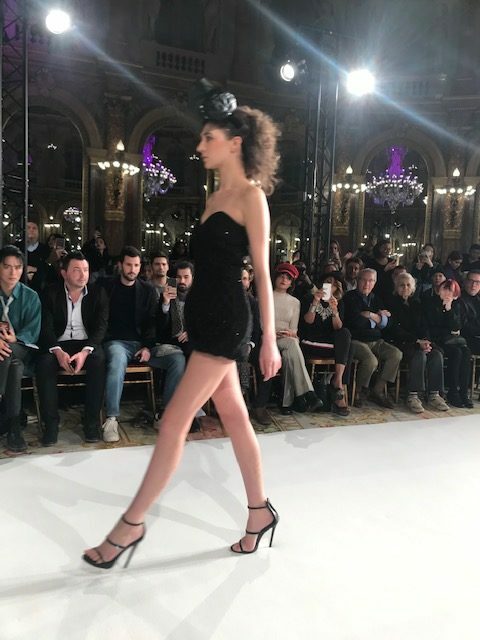 It was with sadness that I attended my last Paris Fashion show in the Salon at the exquisite Plaza Athenee. 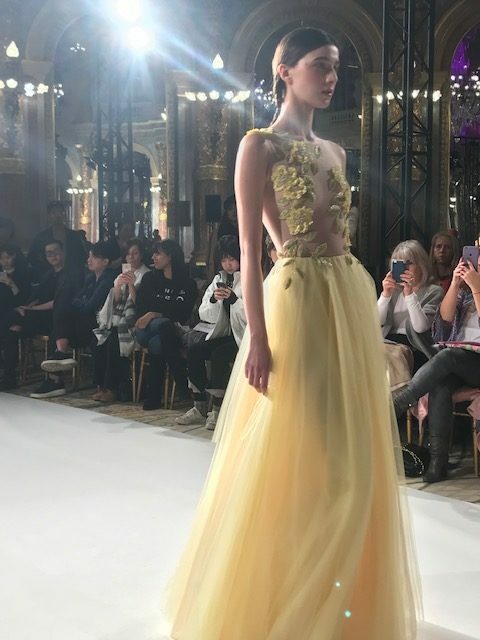 The fashion shows and designs that I’d seen for Spring/Summer 2019 had me very excited. Perhaps it was because I’m Australian and we wear summer clothes for most of the year that I had fallen in love with so many designs. 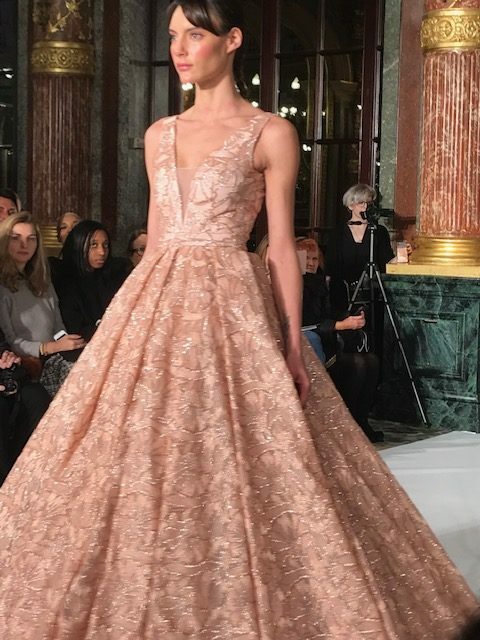 Perhaps it was because I loved the very feminine silhouettes and romantic colour palette coming through. Perhaps it was the thrill of my first time sitting in the front row. 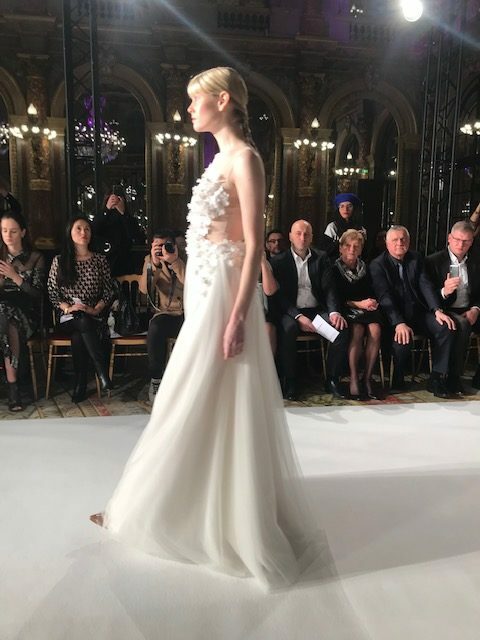 It’s amazing how being up close and personal gives you a newfound respect for the craftsmanship of Haute Couture. 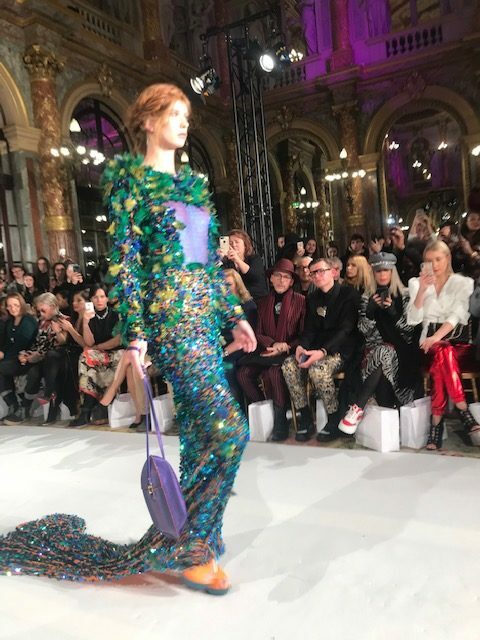 Yet my sadness suddenly turned to joy as I realised I could now share with you some of the latest trends and colours for next Spring/ Summer and perhaps spread a little of the Haute Couture magic. 1. 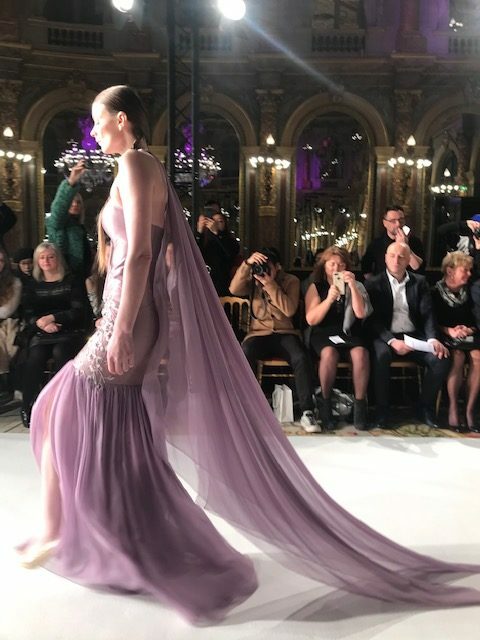 Colour- Pastels were Queen!From the feminine dresses in pale pinks, pale yellows, apricot, lavender, lilac and mint in the La Metamorphose runway show through to the edgy Salon designs of Armine O’Hanyan in lilac, palest blues and creams. The always colourful Patrick Pham did not disappoint. 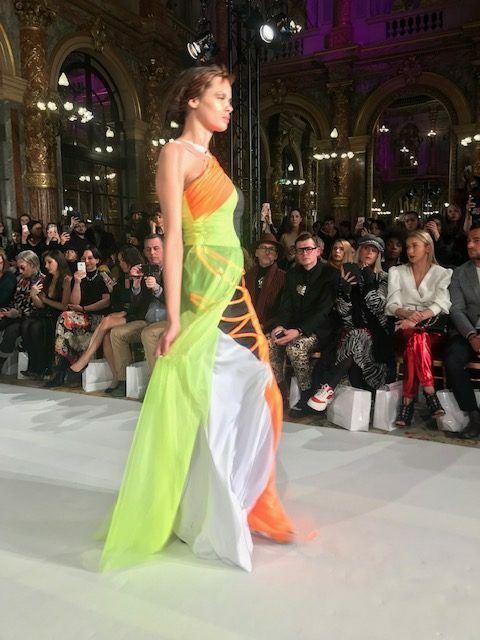 His designs gave a nod to the 80’s, showing off a riot of colour with neons in yellow, orange, red and green. Cypriot designer Maria Aristidou chose an elegant muted palette inspired by an ancient door and imagined the colours to be found behind this door. 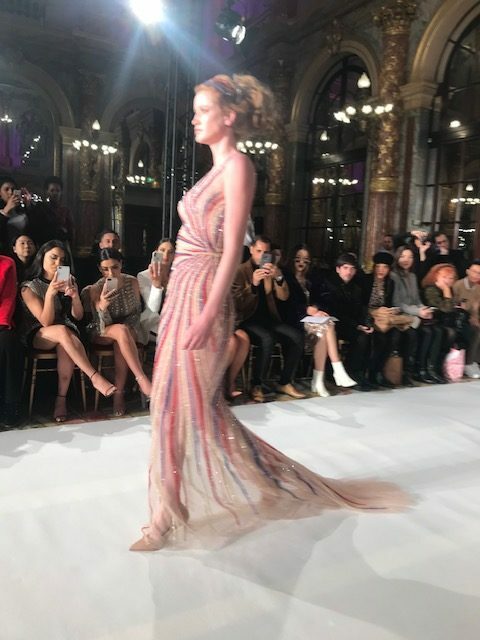 Her ‘ Symplexis ‘ collection featured shimmering knits in rusty brown, muted golds and light green, daring lilac, fuschia and grey mixed together, plus her signature red evening dress. 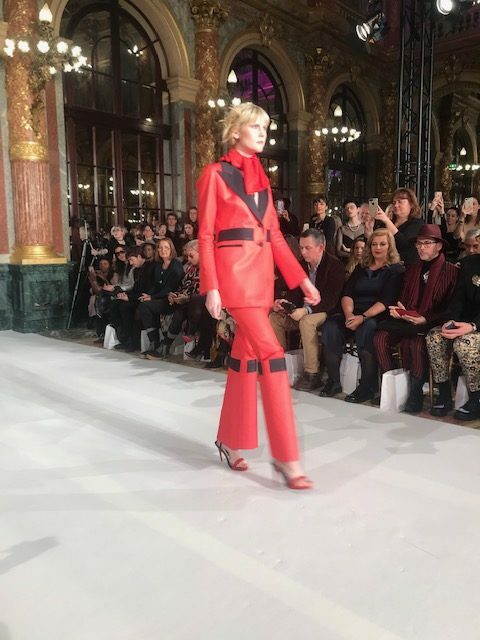 Red was found in some form in most collections, including that of Dior. White was also very much front and centre as one of the freshest ways to say ‘ Bonjour ‘ to Summer. 2. Sheer- It’s hard to forget Naomi Campbell almost breaking the internet wearing her sheer black top when walking for Valentino. 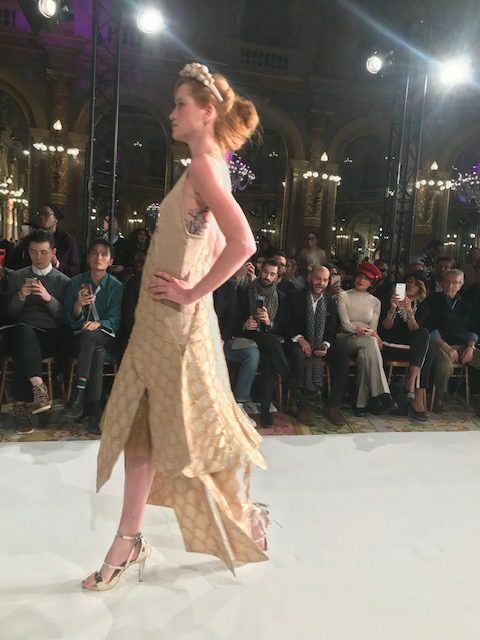 Sheers in tops and skirts graced the runways at most shows. 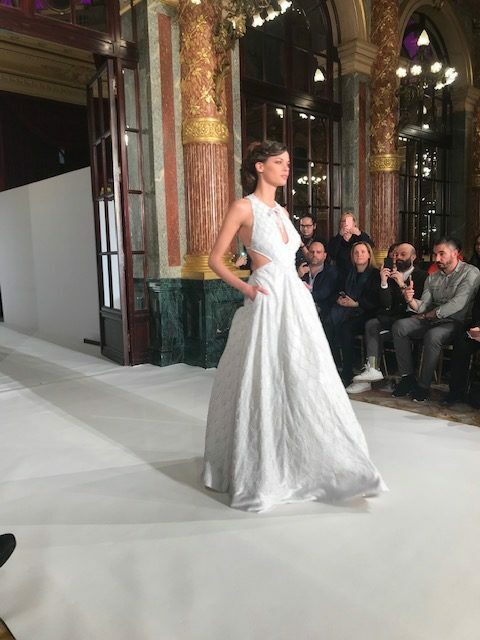 Katrina K Couture showed some elegant sheers in gold, white, cream and black. 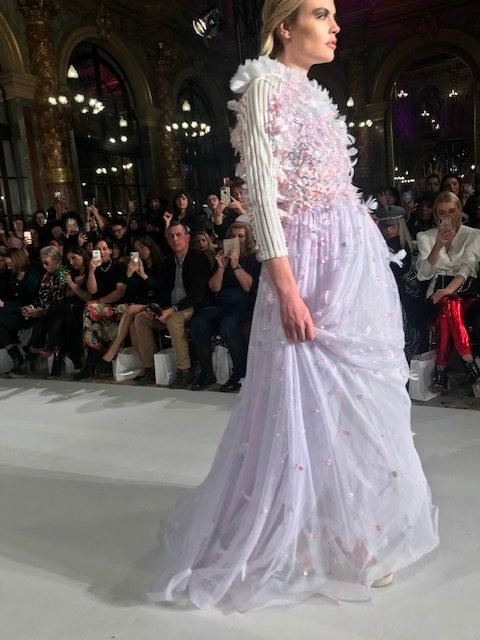 Armine Ohanyan incorporated sheer tops in pink, the palest of blues and lilac. 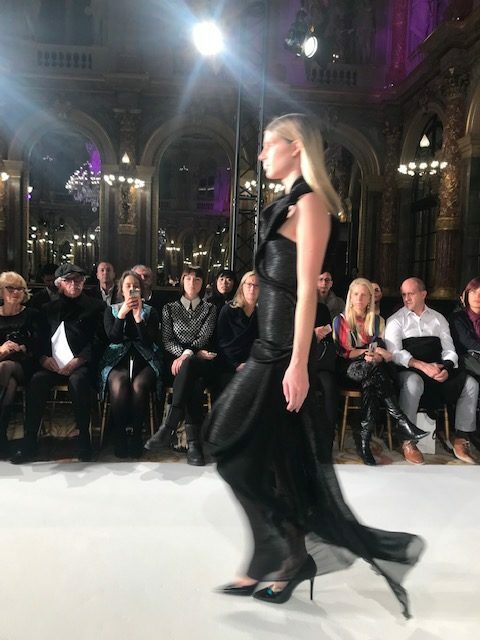 Whilst over at the Dior show in Musee Rodin, sheer black looks were cutting edge. 3. 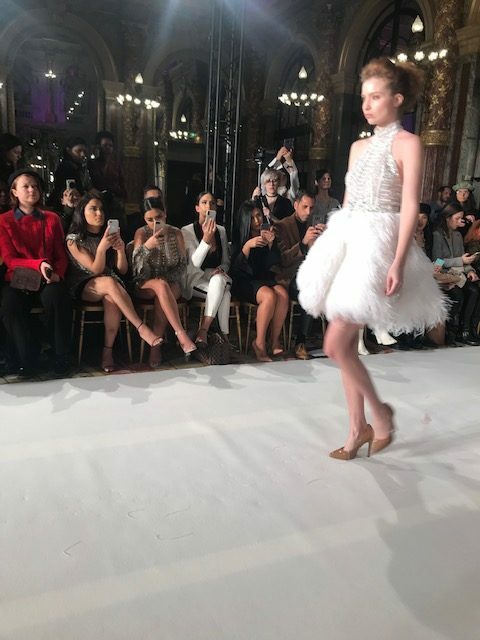 Embroidery and Embellishment – Intricate details were included in the form of flower petals, butterflies and feathers paired with beads, lace, tulle and netting. 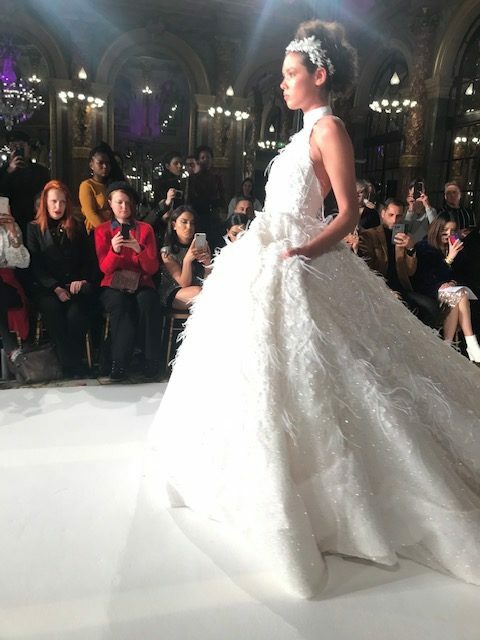 From Alin Le’ Kal we were dazzled by his use of Swarovski crystals and a multitude of striking embellishments plus the ‘ wow ‘ factor of his magnificent feathered ball gowns. 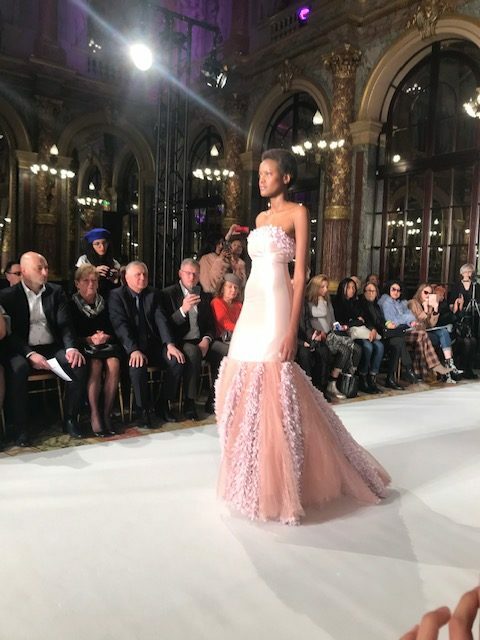 La Metamorphose showed their eye for detail with ever more intricate feminine embroidery in day dresses and feminine gowns. 4. Metallics- Gold reigned supreme with silver a close second. 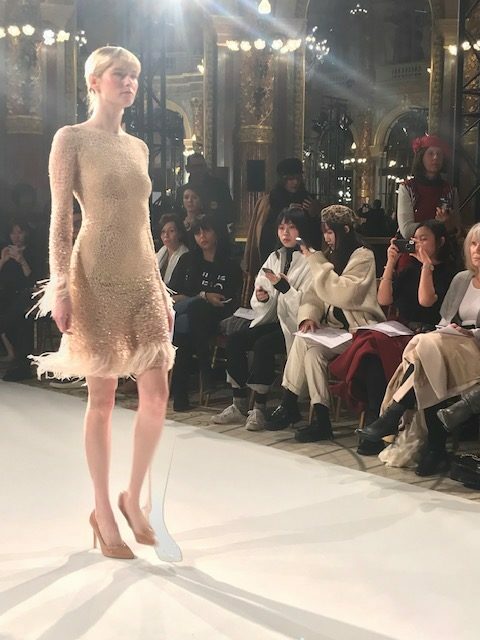 Bronze and other shiny pieces were seen on every runway. 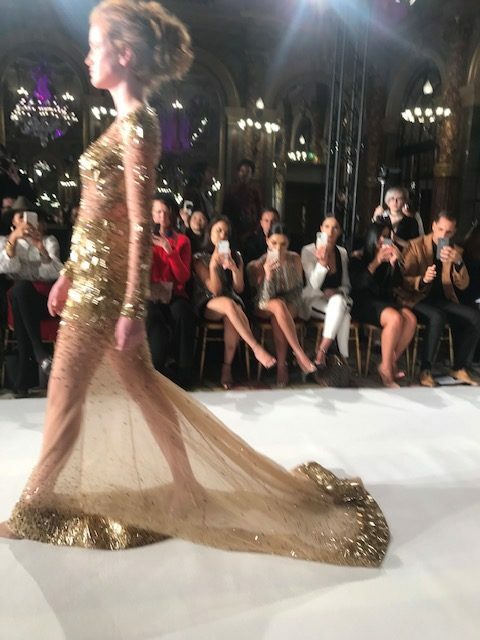 I loved the gold jumpsuit from Alin Le’Kal and Katrine K’s brilliant use of shimmering gold paired with white fringed leather skirts and designer pants was so covetable. 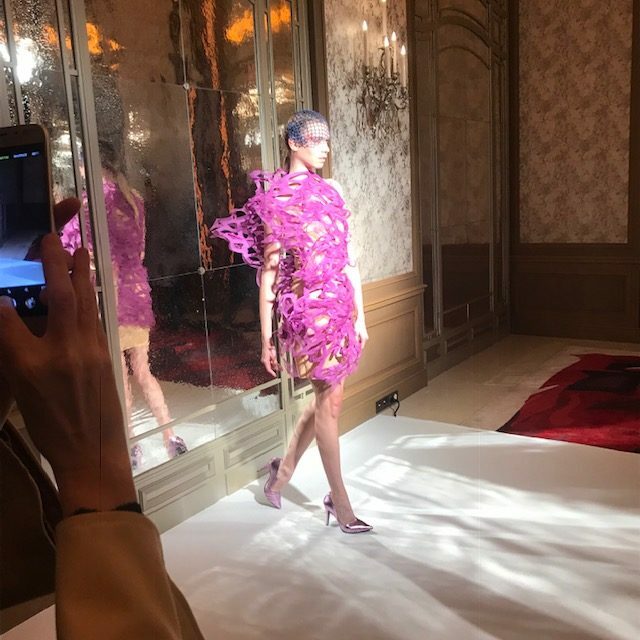 Patrick Pham’s riot of colourful metallics in his gowns ensured you’d be noticed as soon as you walked into a room. He showed us all how to sparkle and shine. 5. Ruffles- Ruffles were everywhere! 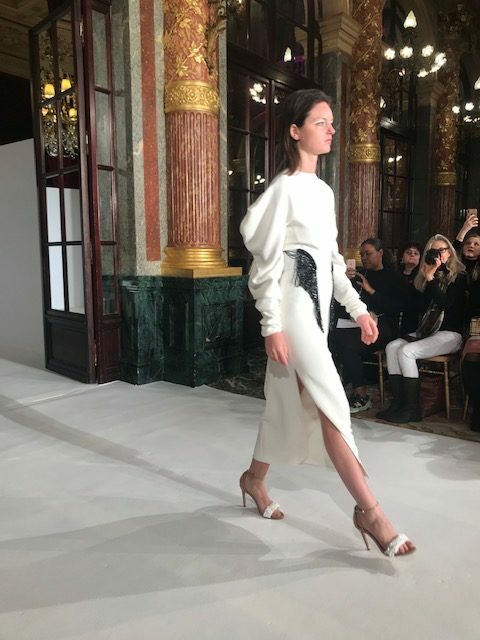 In sleeves, around waists, on skirts and on voluminous ball gown skirts, a la’ Viktor and Rolfe. 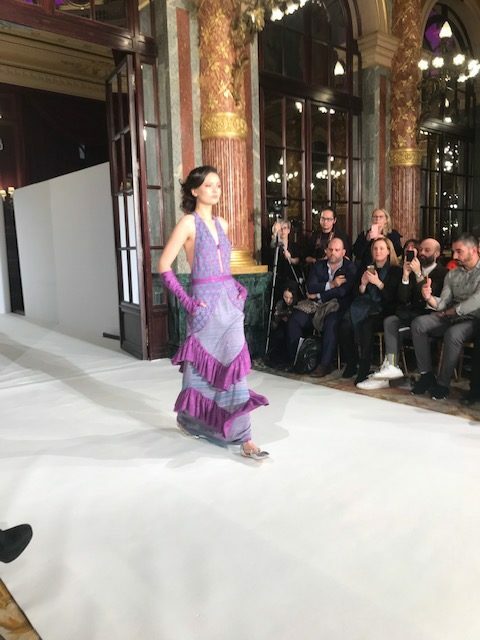 I loved Maria Aristidou’s understated ruffles, particularly on the sleeve of her one shouldered shimmering red gown and on a purple and pink backless dress just made for dancing. 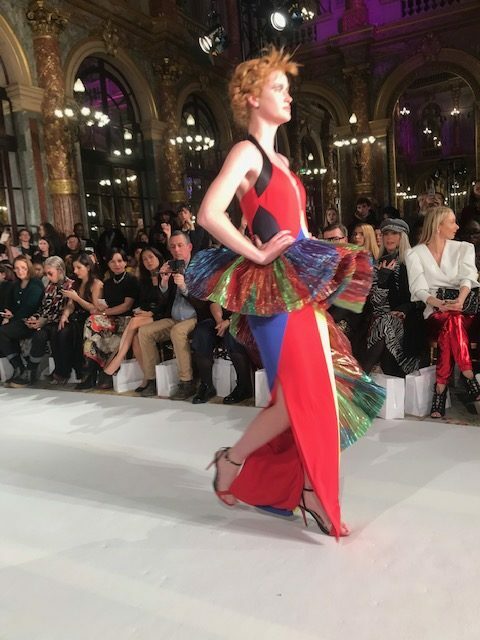 Armine Ohanyan took pleats and ruffles to the limit in her dresses and the colourful ruffled skirts on Patrick Pham’s rainbow coloured gowns and skirts added a playful and swishy touch. 6. 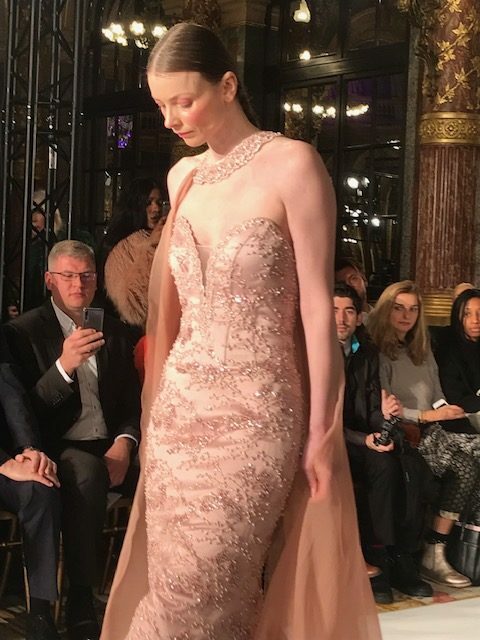 Back details- Every time a model turned around there was a new detail to discover. 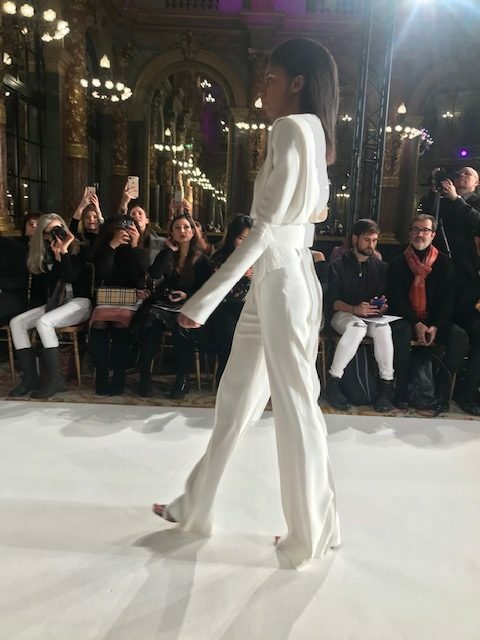 The revealing touches emphasising that ‘ the back ‘ will be on display for Spring/ Summer. 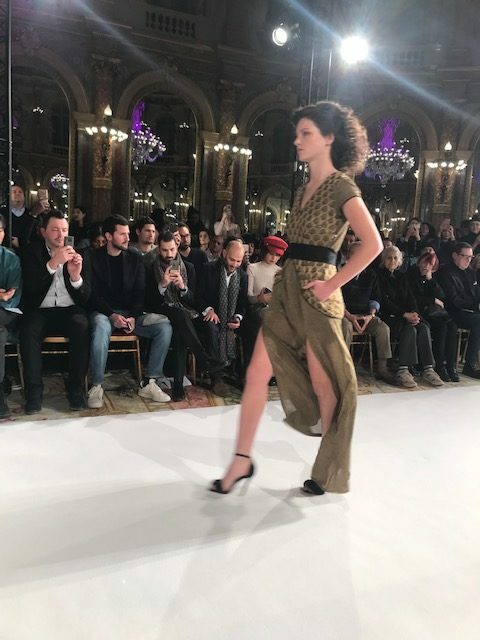 Alin Le’ Kal showed a mastery of this look in his figure hugging silhouettes. 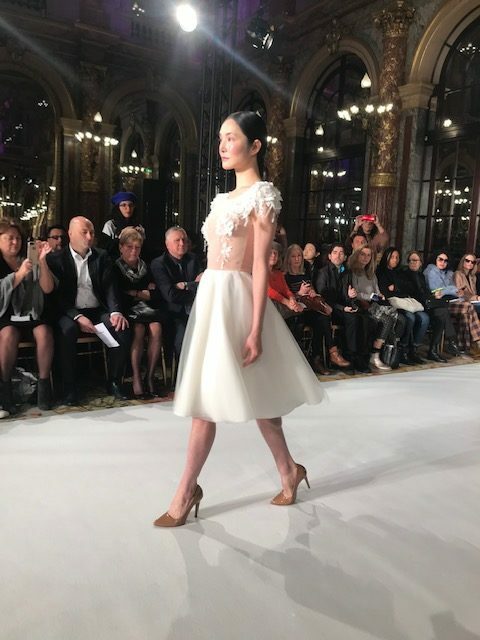 Gowns and dresses from Maria Aristidou also showcased this design element to perfection. 7. Statement Sleeves- Hooray for people like me who just adore a statement sleeve. There are no signs of this trend stopping any time soon. 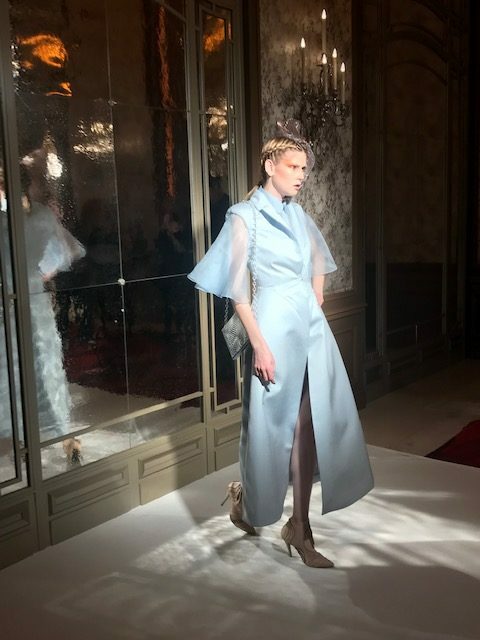 Katrine K. showed off a range of sleeves -leg of mutton style, super long sleeves , embellished sleeves and oversized sleeves flopping off the shoulder. Stunning! 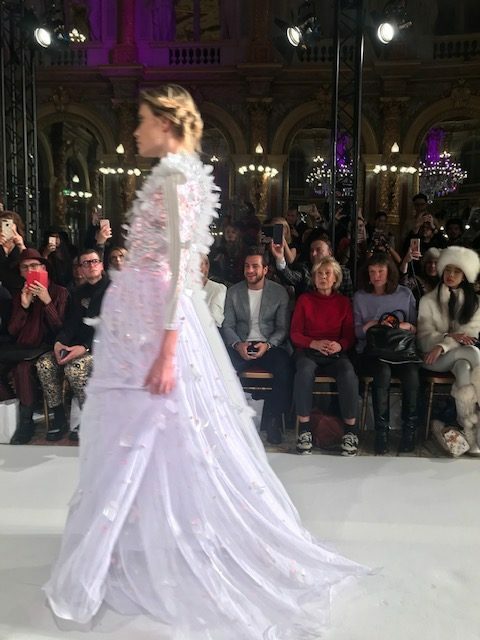 Patuna wound fabric in ethereal swirls as sleeves for their gowns and Armine Ohanyan had billowing sleeves with laser cut- outs and pretty flutter sleeves. 8. One Shoulder- Get ready to show those shoulders. The one shoulder look was front and centre in every collection. 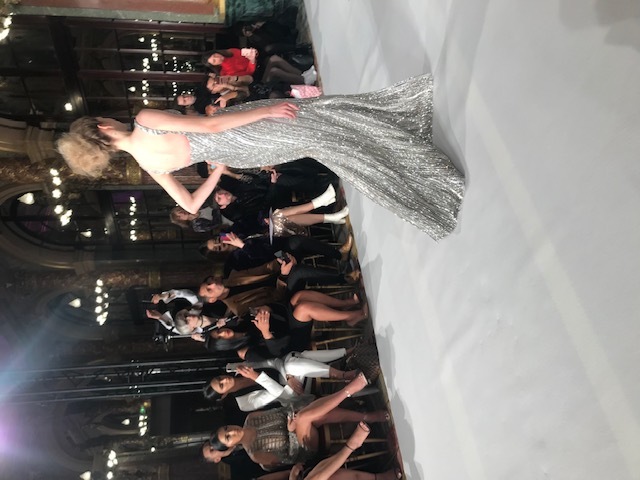 From the futuristic silver and lilac ruffled and pleated mini from Armine Ohanyan through to Patrick Pham’s neon yellow gown with a rainbow of neon colours and sequins as embellishment. 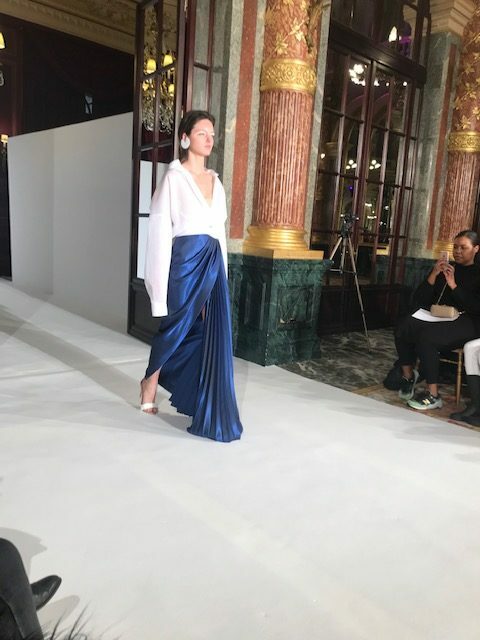 This was in contrast to Katrine K’s pared back Fluid Fluorite satin dress with one long sleeve that was paired with a gold embellished pant. 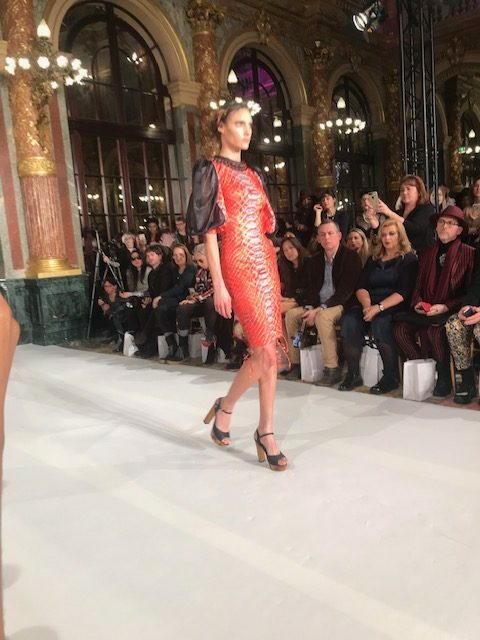 Maria Aristidou mixed it up with one shoulder and a ruffled long sleeve on her red gown. 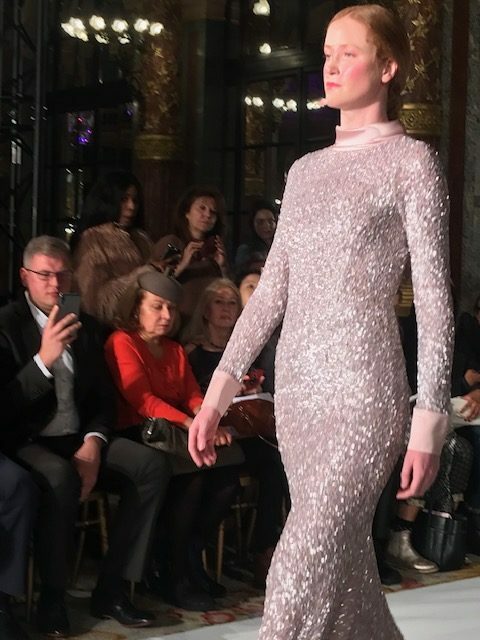 I loved Katrine K’s one shouldered navy blue sequinned gown and could imagine heads turning as you walked into a room wearing this sparkler. 9. 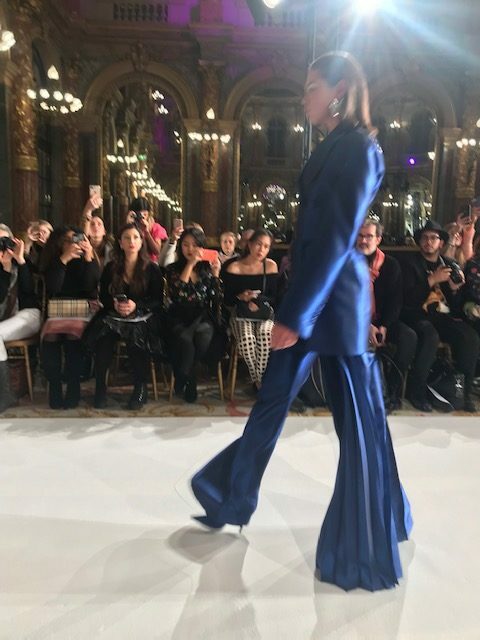 Pant Suits- Perhaps my next purchase will be a beautifully tailored pant suit after seeing so many versatile and stylish options on the catwalk. 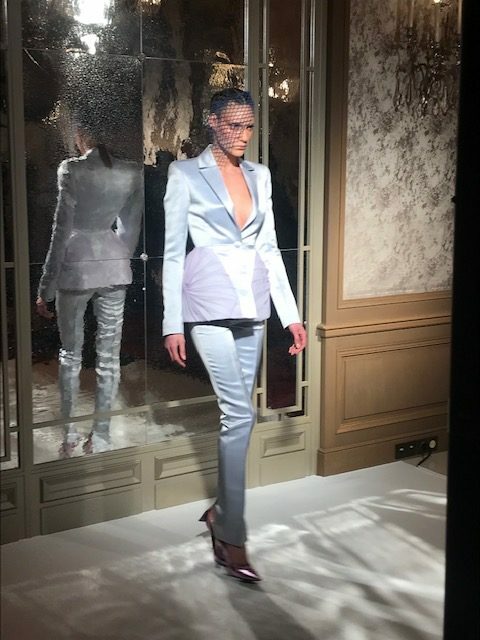 I loved the black evening suit embellished with side metallics from Alin Le’ Kal. Patrick Pham’s bold red with black was an eye- catching option and a rainbow neon retro suit turned heads. 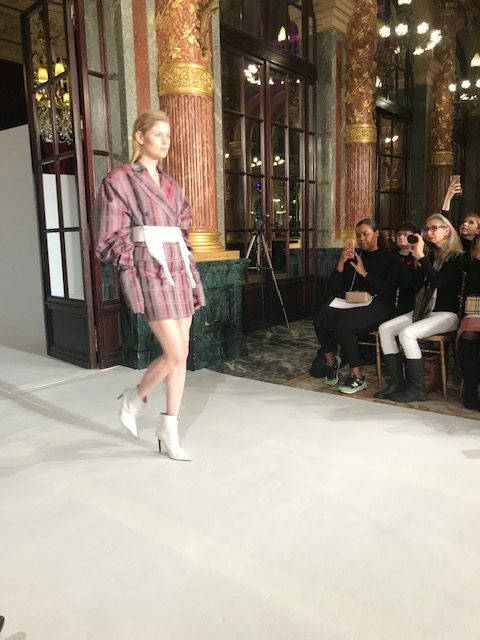 Katrine K’s checked long trench coat and wide legged asymmetric pleated trousers in grey and black checks was a stylish option. 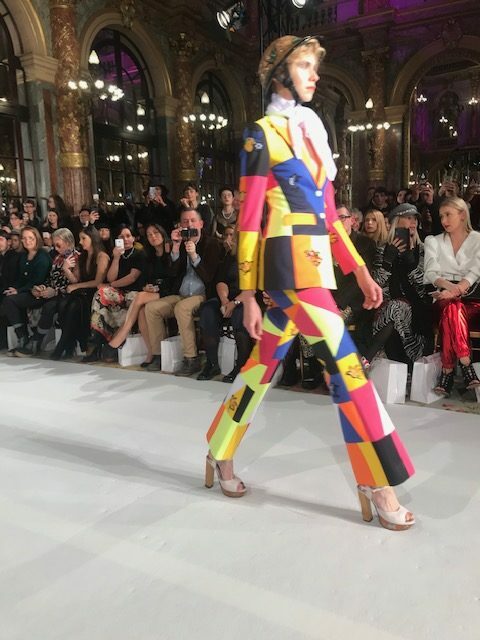 I could imagine Queensland Symphony Orchestra’s Alondra de la Parra rocking this international look. 10. Full Skirts and Tulle Skirts- Tulle skirts were prolific. 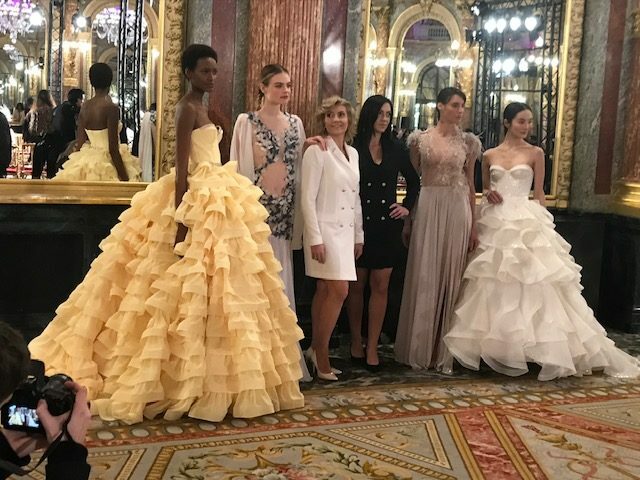 It was a big look at Dior and at the shows I attended many of the beautiful gowns sported tulle skirts in pale yellow, lilac, black and white. 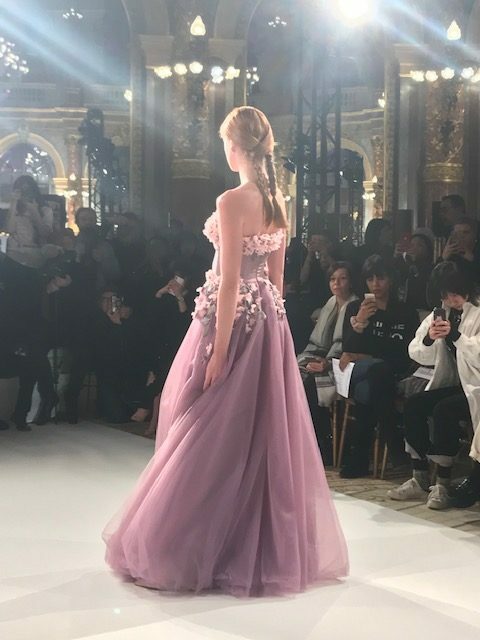 One of my favourites was a lavender gown with a flower petal bodice from La Metamorphose and these same designers wowed in a ball gown in lavender with a shiny fitted bodice and massive full ruffled and tiered skirt. 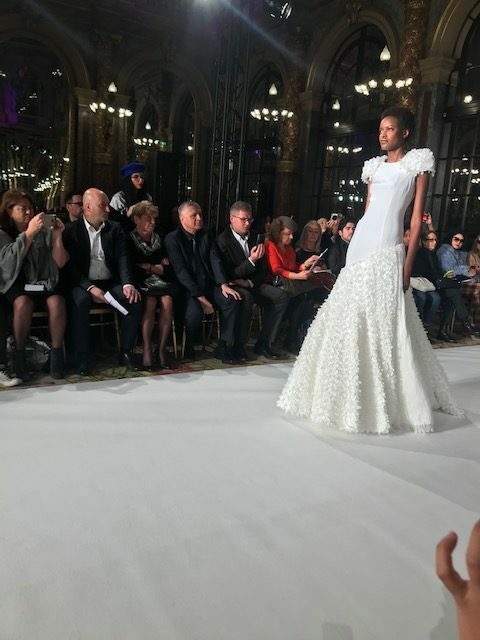 Alin Le Kal’s full skirted wedding dresses had to be seen to be believed and must have taken hours of craftsmanship. 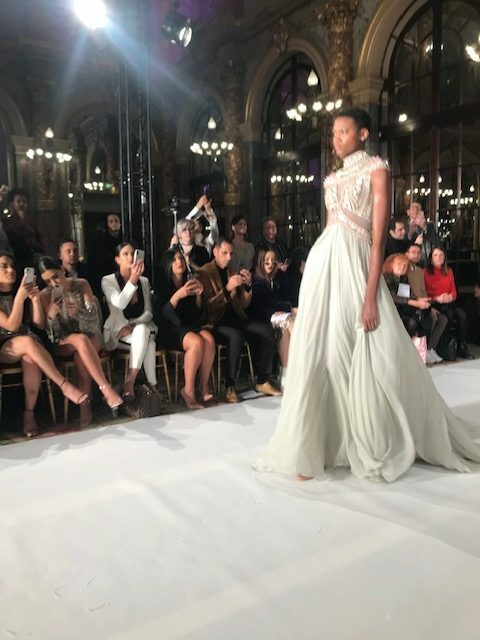 Spring/ Summer has never looked prettier and there’s sure to be a trend to suit your style whether you have a pared back style, love a feminine touch or prefer to stand out with a pop of colour or sparkle. 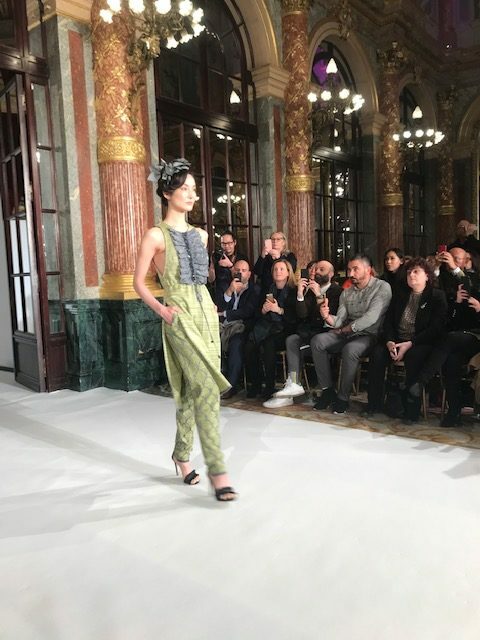 Fringing, black and white and designer jumpsuits either short or long were other notable looks. 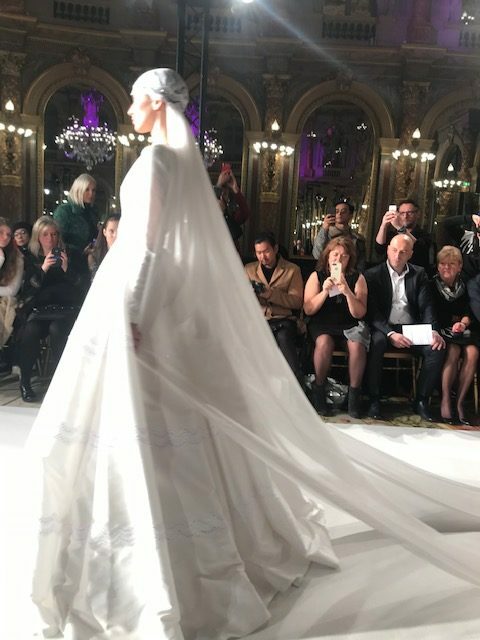 Every Haute Couture and Couture Designer has their own unique signature. 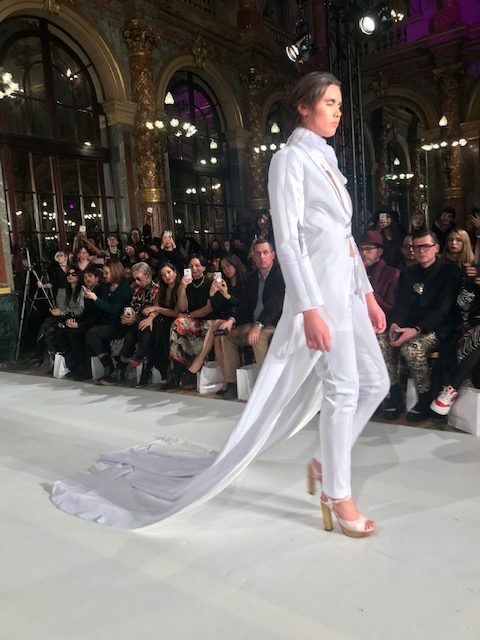 Haute Couture Shows inform the looks we’ll all be wearing, although many options on the runways are so beautiful they are really wearable pieces of art. 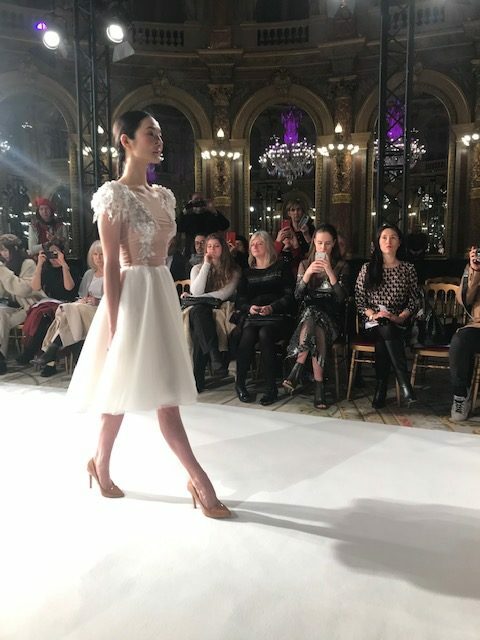 I was so glad of this sneak peek into the upcoming trends and look forward to sharing the work of several new designers and some of my all – time favourites here with you at SheSociety.